MUFF WIGGLER :: View topic - uO_c 8hp ornament and crime. uO_c 8hp ornament and crime. 8hp o_c! You may have seen this at knobcon or something. Here is the github page for it. “Both ways” power so a 10 pin power cable has no wrong way. Through hole capacitors replaced with smt ones. Build-resellers, please read the license info on the original ornament and crime web site, you can not just make these boards and sell them willy nilly, you should arange with mxmxmx to pay something per board to the development fund. This looks like the first "µRemix" module that does NOT have a horrific unusable-looking layout. I like the nice logical vertical arrangement. Good work! Is the screen the same physical dimensions as for the original Ornament & Crime? If you're selling them prebuilt, I'll buy one. Have a look at uBurst, what do you think of its layout? 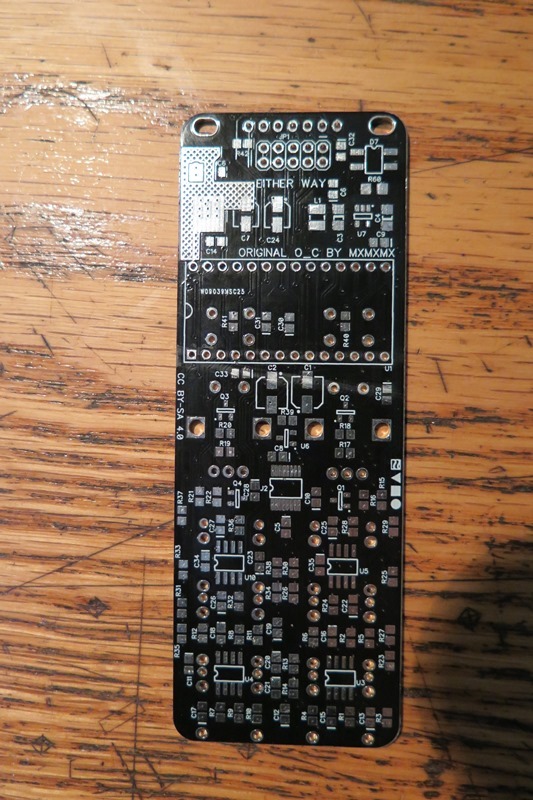 although i designed the boards for the others, (ubraids mk2, plancks) that is the only other one i did the layout on as well. Very cool layout in my opinion. 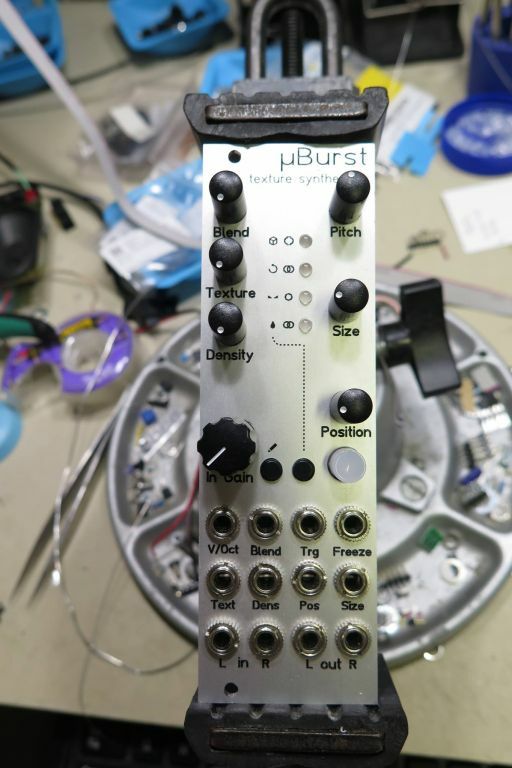 As much as I appreciate the design of something like Folktek and Make Noise modules I find it easier to work with very straightforward and designs like this version of uBursts. I know there is another variation on uBursts floating around with a more complicated front panel design/jack placement. I'd go crazy using that thing but appreciate the layout of the above (especially for preserving the MI icons, wish my Rings clone did that). Not a fan of the μBurst layout. Of the Clouds controls, I probably twiddle Density most and In Gain least. So that feels all backwards. Also I’m not a fan of such tiny knobs — I tolerate them (actually the same type) on my NLC Cluster, but if I could have one Euro wish magically realized, it’d probably be an 84hp version of Cluster with much more empty space for my fat fingers. I'm intrigued by the uO_C, good work! I'd love to see a matte-black-and-gold panel for that. Just want to make sure I'm getting the right size display, uO_C is also using the 1.3" OLED, right? There is a link to the correct display on the BOM, Display spread sheet. I'm still working on that btw..
Congratulations on an excellent design. Looking forward to getting one when,they start becoming,common place. Well done - this seems like a perfect addition to a classic-sized one for those functions that don't require knob tweaking. Looking forward to it. someone building for sale : uburst and uO_c, also need 1 mi branches in EU? Any idea when PCB/panel will be available ? I'd like to build one for my system. I'm also interested in a pcb/panel. Im importing the gerber files to OSHPark and I just want to verify that they look good. The big solder mask at the top looks a bit weird to me. Does this look correct to folks? I'd also be interested in a PCB/panel! Just finished my o_C and I love it! !